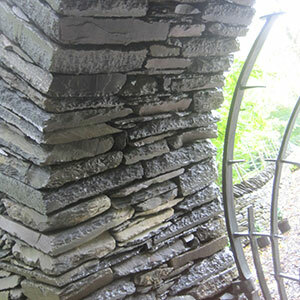 Dry stone walling – new beginnings. Within these posts I will obviously draw on my experience as a professional dry stone waller with over twenty five years involvement in the craft. I have chosen this medium in which to express my opinions as I find Face Book and other forums too contentious. Any comments I make are only my opinions, I can sometimes be quite outspoken but I ask to be excused of this as it is only my passion for the craft that leads me to such strong opinions. The first half of 2014 has been very eventful, in March I travelled to Edinburgh to attend the Dry Stone Walling Association’s AGM where I was presented with my second full Pinnacle Award for the dry stone walling at Brackenrigg in Cumbria. This is my second full award, meaning Hugh Drysdale from Scotland and myself are the only two dry stone wallers ever to have been presented with two Pinnacle Awards. Three months of 2013 were spent on the Isle of Skye in Scotland constructing an impressive dry stone sanctuary on a beach. 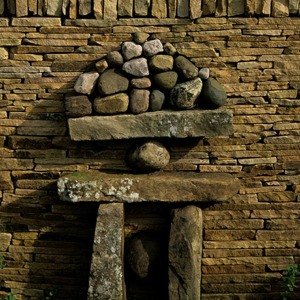 Probably the most complex structure Andrew has ever been asked to build using dry stone walling techniques.